This video shows how to link beads by wire wrapping them and how to finish them by attaching the chained beads to chains. 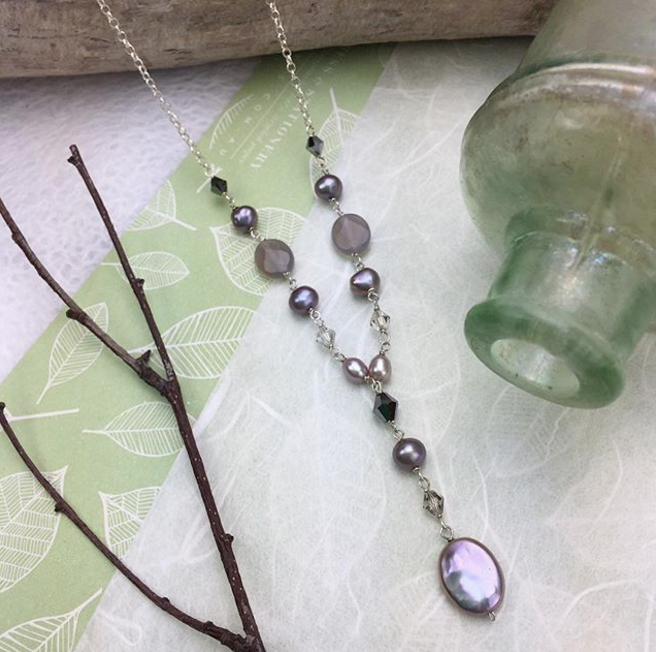 Use 26 or 24 gauge dead soft silver wire for best results when using small beads like pearls and crystals. To do this most efficiently, thread all beads on in the order you want them to appear. By using round nose jewelry pliers gently grip 1.5cm (or 2com if you wish to make more wraps) from the end of the wire. Bend the wire a full circle around the tip of the plier. Then wrap the wire back around itself, moving the wire tightly with your fingers. Trim off the excess wire, leaving an enclosed loop. Move the bead against the loop and proceed to do the same on the other side. Now you have a bead with two small secure loops on either side of it. Take the long wire and repeat, but this time, slide the loop from the previously wrapped bead into the new loop before wrapping it closed. To attach chain, before finishing the last loop, slide the wire of the unfinished loop through the link of the chain and finish wrapping it, securing the chain in the loop. This entry was posted in Tips for Artisans, Designing, Jewellery Business Advice and tagged jewelry making, jewelry making techniques.